RCI, the global leader in holiday exchange, celebrated industry leaders in South Africa at its 28th Annual RCI OSCAS Gala Awards this week. The event was held at the Premier Hotel O.R. Tambo in Kempton Park, in South Africa. The OSCAS Awards ceremony is held annually, in South Africa, to acknowledge the successes of industry partners and their contributions to RCI in Africa. This year’s event was co-hosted by Dimitris Manikis and Howard Nusbaum. The glamourous entertainment for the evening was provided by The Muses and Swing City. Seventy-two awards were handed out this year, including a Special Recognition Award for an act of valour. Six resorts also received RCI resort quality upgrades in recognition of enhancements they have made. Howard Nusbaum kicked the evening off by presenting the Special Recognition Award to Meresh Sukdeo from Umhlanga Sands Resort. Sukdeo was honoured for saving the life of a child who needed to be resuscitated after an incident in the resort pool. The recipients of the Investment in Hospitality Awards were Breakers Resort, Chaka’s Rock Chalets, Champagne Sports Resort, and Sun Vacation Club, all of which have invested significantly in the renovation of these resorts, thereby elevating the image of the timeshare industry and the quality of the product. Boulder Bay, Mabula Timeshare, and St. Michaels Sands Hotel & Timeshare Resort were honoured with Long Service Awards for being affiliated to RCI for more than 30 years. The RADA Business Support and Resort Operations Awards recognised the invaluable work done by the operations and back office staff who ensure the smooth running of our resorts and businesses. These included recognition for the managers and employees of the year in various categories. Dream Hotels & Resorts clinched the RCI RADA Technology & Innovation Award for re-launching a new website and opening a training and development school in Montagu. The RCI Value Awards went to Caribbean Estates for its environmental initiatives, and to Sondela Nature Reserve for its community involvement and environmental projects. This year’s Category Awards were won by La Côte d’ Azur, a First Resorts’ property that won both the Top Resort Maintenance and Top Unit Maintenance Category Awards. Wilderness Dunes, managed by Legacy Hotels & Resorts, took the award for Superior Service in Hospitality, as well as the award for the Top Check-In & Check-Out Category. 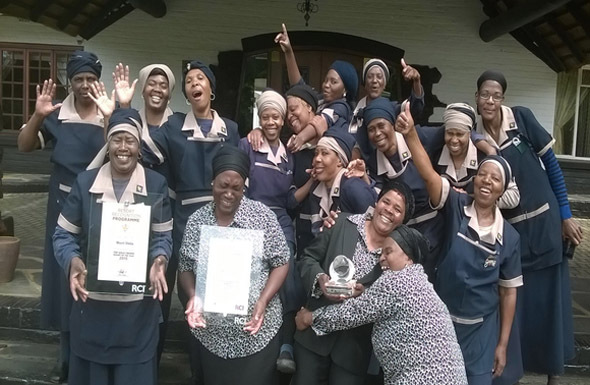 The last Category Award went to Mount Sheba, a Forever Resorts’ property, whose staff took the award for Excellence in Housekeeping. Undoubtedly one of the highlights of the glittering event was the announcement of the Resort of the Year in the RCI Hospitality, RCI Silver Crown and RCI Gold Crown ratings. This year Vacation Recreational Services (VRS) clinched three of the five Resort of the Year titles: RCI Gold Crown – Large was awarded to Ngwenya Lodge; RCI Silver Crown Resort of the Year was awarded to Ekuthuleni in Hoedspruit; and Hospitality Resort of the Year went to Morrumbene in Mozambique. The Top RCI Gold Crown Resorts – Small went to Millstream, an independent resort in Dullstroom, and the Top RCI Gold Crown – Medium went to La Côte d’ Azur, a First Resorts’ Property in Margate. The event culminated in the highly-anticipated announcement of General Manager of the Year Award. This award considers the resort’s overall rating, its hospitality rating, and its service to guests. Last year’s joint winners, Brett Bailey and Jon-Kilroe Smith, handed over the prestigious trophy to Jackie Vincent of Millstream for her excellent management of a resort that has won the Resort of the Year Award four times in the past six years.